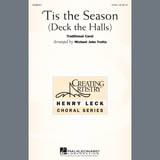 'Tis The Season (Deck The Halls) (arr. Michael John Trotta) spartiti da Christmas Carol è al di sotto. Abbiamo 1 arrangiamento per 'Tis The Season (Deck The Halls) (arr. Michael John Trotta) Voce Partiture.